Sangria is a delicious fruit-based wine "punch" with roots in Spain, but now popular all around the world. Typically, sangrias are made with red wine, fresh seasonal fruit, and a bit of bubbly water or citrus flavored soda. They're easy to make, even easier to drink, and a huge hit at summer parties. One of the beauties of sangria is that you can use a variety of different wines in the recipe mix—often, a wine that hasn't been finished the day before will find its way into a sangria pitcher. Wines in the good value category are also the perfect sangria base. All of the wines listed in the sangria wine guide are good ones to drink on their own and have been selected for their specific flavor profiles and style components to highlight the various fruit additions in these recipes. Keep in mind that all of the following recipes are based on a standard 750ml bottle of wine. This refreshing recipe maximizes the fruit content and adds a new twist, using white wine instead of traditional red ones. A super simple twist that features white wine as its boozy base, this vibrant drink is also infused with three types of citrus and ginger ale. This red sangria marries together the flavor from several fruits. It's always a favorite for big summer parties, so you may want to consider doubling (or even tripling!) the recipe. Whether you're working around dietary restrictions for specific health reasons or just trying to limit your sugar intake in general, this drink—which uses agave nectar instead—is for you. Imagine sweet strawberries zipped up with a fresh squeeze of lime and a lively dash of mint, propped up by a rosé. This pretty-in-pink sangria finds its flavor footing in the limeade-like synergy of tart citrus and the decidedly sweet side of the fresh strawberry. Usually, the best sangrias are the ones that are made ahead, allowed to "marinate" overnight and packed with more fruit before serving. However, you can plan ahead for spur of the moment events by making these sangria ice cubes. When unannounced guests pop by (or a sangria craving hits), simply drop a few in a glass of wine for an instant party hit. 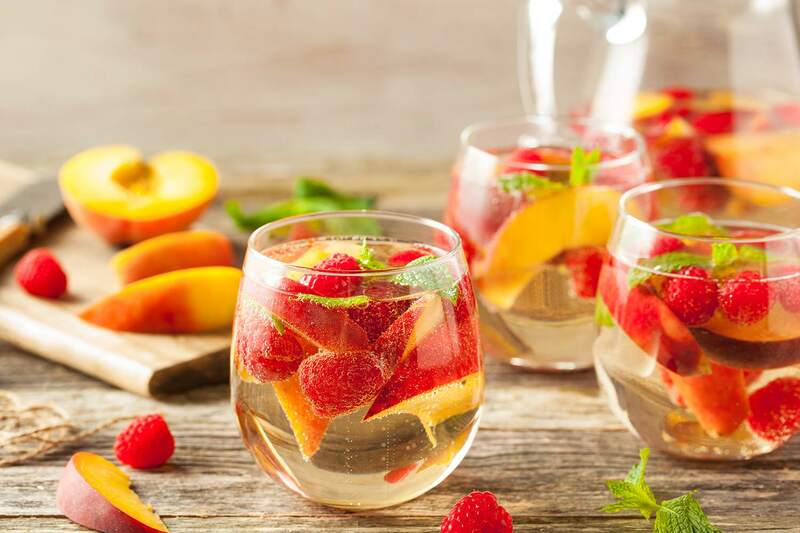 A refreshing warm-weather drink that ups the ante with a splash of peach schnapps, this made-for-summer recipe—which also includes slices of fresh fruit—will add sizzle to any seasonal bash. Use pineapple and passion fruit juice mixed with a sweeter white wine to make an unforgettable sangria that'll transport you to a faraway island. Kiwis and limes go into this knock-out punch with origins from the land Down Under. Use a New Zealand sauvignon blanc to further play up its roots. The beauty of the basic sangria is that it's as delicious as it is easy, and it only gets better as you spice it up with fruits, spices, or herbs of your choice. A flashy sangria that is sure to light up any back deck party, this white wine concoction is easy to make and quick to refill. It offers a powerful "cocktail-like" punch with its dash of vodka. Fresh raspberries and lemon slices add to the puckery zip of this grown-up lemonade. 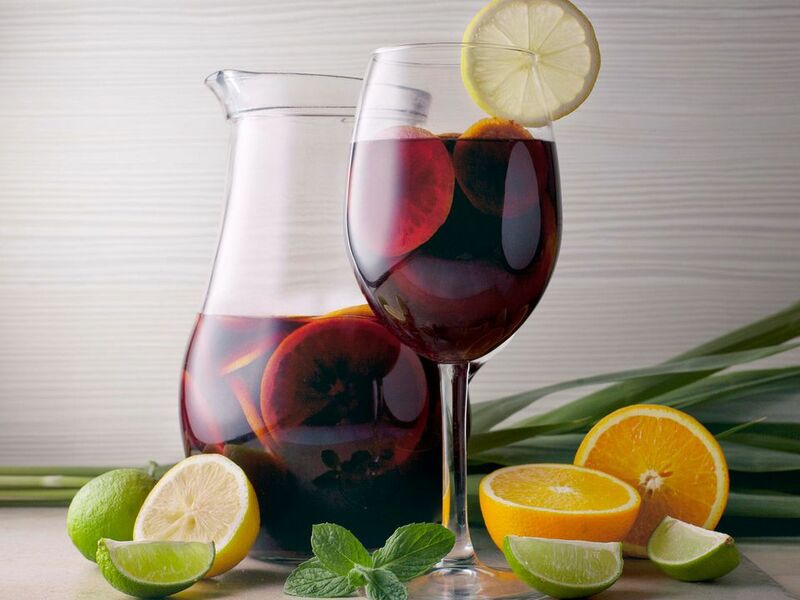 You can use a mix of white wines or just stick with a single bottle; either way, the sangria combines the bright citrus flavors of lemon with the sweet taste of berries for a refreshing blast to the palate. This is the wine lover's answer to strawberry daiquiris. Take full advantage of one of summertime's favorite fruits and mix it with one of the summer's most requested wines, a rosé! The stunning red-hued drink is sure to be a hit anytime, anywhere. This is a red wine-centered recipe that plays off of the top fruits found in the crimson varietals. This means the recipe offers a simple approach to fruit and wine pairing that's also delightfully delicious. Sparkling wines increase the celebration factor for any occasion. Make it an event with this delicious sparkling rosé-based sangria. This tropical punch takes a white wine of your choosing and marries it with the island ingredients like fresh-cut pineapple and coconut rum, accented with a sprig of refreshing mint. Take full advantage of the sweet synergy between strawberries and lime, then turn up the volume with a sprig of lively mint. Add them to a bottle of sweet moscato and voila, this sangria-like mixer is party-ready!